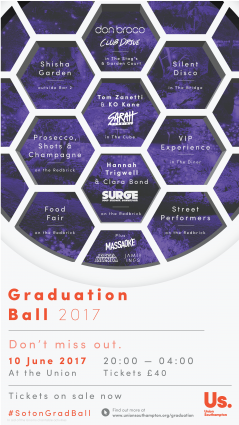 You will (of course) need to be wearing your Grad Ball wristband, but also remember to bring your Student ID. You will need to show both in order to get in! Bought your ticket but didn’t collect your wristband? That’s ok, these things happen. Our staff on the gate will have your wristband waiting for you. They’ll just need to check your Student ID, and you’ll be good to go. Didn’t buy a ticket? Luckily for you, we’ll have a handful of tickets available to buy on the door. You’ll need to bring £40 in exact cash, plus your Student ID, and we’ll do our best to sort you out. However, when we say “a handful”, we mean a handful! We’ll be working on a first-come-first-served basis, so make sure you get there early. For all you late-comers, there’s no last entry time, but our headline acts will be taking to the stage between 23:00 – midnight, so you’ll need to be here before then if you’re hoping to catch one of the shows. And there you have it! We’re so excited for this year’s Grad Ball, and can’t wait for you to see what we’ve got in store for you. Here’s to the end of an era, and a fantastic night!